This country is become increasingly less like one where ability regardless of birth equates to success. As the Government has reminded us recently one of the key drivers of this is the existence of a private school system. There is a correlation between success and wealth on the one hand, and intelligence on the other, and arguably that is fair (although perhaps at the top end the correlation is too strong). But there is no reason why this should be perpetuated to a second generation; the highest ability children should end up in the best schools and so universities regardless of background. I have a few ideas that might help to do something about this. If they are implemented then we will see in the first year middle class parents desperately trying to get their kids into the worst local primary school they can find, and by year seven almost all inequality between primary schools completely evened out. First though some qualifiers. At first blush this might seem an unusual subject for me to be writing about on this blog. Am I even qualified to do so? Well one thing I know something about is the use of incentives to persuade people to do the right thing (the famous 'nudge' effect that the government got excited about a couple of years ago). As you will see I don't think the obvious solutions will work as they won't change the incentives and / or they smack of totalitarianism. Its better to make people want to behave in a way that is better collectively but also make it better for them personally. This is why I hope that friends and acquaintances of mine with children in private education won't take this personally. They are just responding to incentives themselves; if you perceive a private education to be the only way for your children to succeed and you have the money to pay for it then it makes sense to do it. I don't personally agree with your perception, and I certainly don't like the fact it is so widespread, but that doesn't mean I don't respect your choice. Full disclosure: Like most people I have a stake in this. I was myself privately educated - as an expatriate child there was no choice. We chose to put our children in the state system, and one of them has just taken the 11 plus. I am a school governor, married to an ex State primary teacher. First what we shouldn't do. Its increasingly the case that to get to a top Russell group university you have a better chance if you have gone to a private school. The solution isn't to make Oxbridge et al fix the problem by lowering standards for those at certain schools, but to make the private system irrelevant. When nearly all of the most able pupils are at state schools things will automatically get better, without needing to lower standards at our best universities. The Labour party's almost completely successful attempt to ban grammar schools was a failure. It worked in one sense but then it just led to the ballooning of the private system and a resulting increase in inequality as poor and smart children had nowhere to go. Banning stuff without changing the underlying incentives is exactly when you get unintended consequences. Apart from the fact it would be politically impossible, even if you got the law passed it wouldn't work. Impossible silly laws just lead to large scale evasion. There would be a huge increase in supposed home schooling, and a large number of teachers resigning and becoming self employed 'gardeners' or 'plumbers', or whatever they ask the parents to write on the receipt as they hand over a cheque for Timmie's weekly tuition. I don't want to live in a country where people feel they have to become criminals just to get the best for their children. There are better solutions. We don't need to do all of these, but in some cases they will make things worse not better if implemented stand alone. If a government thinks something is bad they can either ban it (like class A drugs) or tax it (like cigarettes). Banning it often just results in increased profits to criminal gangs, whilst taxing it allows the government to benefit instead. Furthermore private schooling is a luxury good. There is an existing moral and political case for taxing luxury goods heavily. So lets tax private schools. I don't know what level of tax is required, it might be 50%, 100% or 200% of fees. Where do we stop taxing it? Well the private system won't disappear, but it should be reduced to the point where it is irrelevant. At a certain point you can't tax anymore if a 'substitute good' exists which can't be taxed. The top 0.1% of the population, earning perhaps half a million quid a year upwards, would at a push be able to send their children overseas to be educated if they cared that much. That then is probably a reasonable place to put the taxation; at a level where only 0.1% of children are in the private sector. That isn't a large enough cohort of children to seriously distort the system the way the current 7% or so does. I would do this gradually, over seven years, to be fair to those who were already in the system. The government should bring back selective education in all authorities, with a target of 6.66% of school intake going into grammar schools. Nearly all private schools would need to 'turn state' and the extra tax revenue could be used to help fill any remaining gap by upgrading existing outstanding secondary schools. I've chosen 6.66% for several reasons (not because of the obvious religious connotations). Firstly its around the size of the current private sector, most of which I am hoping will be replaced. Secondly it's just a little larger than the top 5% that the grammars are supposed to be educating. Finally it equates to 2 children out of every form of 30 children. That's important for reasons that will become apparent in a moment. I realise that the grammar system is not perfect. The reason it was almost abolished was because it was felt to create a 'them and us' system. Nevertheless we have to recognise that it has made inequality worse not better by pushing many rich bright children out of the state sector entirely, and trapping poor bright children in schools that don't suit their abilities. This measure can't be introduced alone, and the next point needs to be put into place as well. I know exactly what will happen if the above ideas are put into place along, because I live in one of the handful of counties that have Grammar schools. There will be a massive increase in pre 11 plus private tuition as all the middle class parents who can't afford the massive private school fees desperately try and push their children into a grammar. Some grammar schools have tried to get around this by making the tests more like raw tests of ability. However its undeniable that practising certain kinds of questions, at speed, and under pressure will help you, and a poor working class child is much less likely to have had the parental support involved. Its also the case that the entire 11 plus giant testing one day experience is pretty horrible. It also seems unfair that an unpleasant experience that day could have such a big effect on your life. The solution is to introduce selection by school. All state primary schools would have two places per form, normally of around 30 children (There would be a cutoff point for very small village schools, with perhaps only 1 child entered if you had 10 children or less). The eleven plus test would be physically run within each school (although still set and marked externally). This could also make it possible to have a slightly lower pressure situation with the test run on perhaps 3 days gradually over a term. All pupils would be entered. Only those selected would be informed of their results. Yes it will mean that the selective schools won't automatically have exactly the top 6.66% of the cohort. The kid who comes 3rd in one school might well be brighter than the child who comes first or second in another. But I don't think the current system picks the top 6.66% either. I am pretty sure there are plenty of bright kids in that top 6.66% who currently don't pass or even take the test because they are unlucky to have the wrong sort of background, and are in a school and/or family where the test isn't even on their radar. But if every single child takes the test as a normal part of their school year then there is a better chance of picking them up. I also think its far more important that a poor child in a failing school who happens to be in the top 6.66% gets to grammar school than a middle class child of the same intelligence. Because for the latter they are still more likely to succeed later in life, even if they don't get in to the grammar. It will also have the following magical effect - middle class parents will fight to get their children into the worst primary schools! Think about it; do you want little Timmy competing with loads of clever highly tutored children like himself, or with kids you perceive (rightly or wrongly) to be stupid? This means within 7 years there won't be a lot to choose between the ability and social class of children at primary schools. This could even have profound consequences for social integration generally as company directors, bricklayers and nurses rub shoulders on the PTA. Hopefully it will also make people more comfortable with 'normal' state secondary schools; OK so little Timmy wasn't as bright as you thought, the tutoring didn't help, and he was beaten in the (raw test of ability) exam by two kids from the local sink estate but he's made a lot of good friends and he's insisting on going to 'Chav Academy' with them. As a result Chav Academy is going to pick up a lot more bright (but not super bright) middle class pupils than before, and will soon be improving fast itself. This is a nice example of an incentive having intended consequences that reach beyond its initial effect. The main criticism of grammar school remains is that it is still a 'one shot' selection. In Continental Europe selective education into technical and academic streams is widespread. Here in many places they have regular transfers between systems. Psychologically nearly all children are likely to perform better if they aren't at the bottom of the class. After two years in grammar school if a few children in each year consistently aren't coping with the workload then they would probably be better off in a different school. This opens places in the grammar. So the late bloomers or those who had a bad day in the 11 plus and are now top of their 'standard secondary' class by miles should really be in a grammar school. The latter transfer would be optional; the pull of existing friendships might overwhelm the decision. This may seem harsh and Darwinian, but it is all about recognising that an exam on one day might not be the best judge of ability, that children develop at different speeds, and that children will do best in a school that suits their abilities. Although I have presented these ideas together, to a degree they can be implemented separately. Selection by school and transfers could be implemented by existing grammar schools 'tomorrow' (well next year anyway!). A larger grammar system won't need private schools to be taxed almost out of existence, and indeed may alleviate the need for that step to be taken. After all if there was an excellent grammar up the road, why pay tens of thousands a year if your child was bright enough to get in? However to reiterate it would be dangerous to expand the grammar system without removing the tendency for richer kids to pass the 11 plus which poorer kids might not even take. Banning grammars was a cack handed failure at reducing inequality that made things worse; so lets reintroduce them but make sure they don't just become new bastions of middle class privilege. I don't believe that trading and investing in the financial markets requires a huge amount of skill to do reasonably well. It's mostly avoiding making a series of typical mistakes. Here then are my Seven Deadly sins of trading to stay away from. Some of these will be familiar but others are often overlooked. True skill in trading is very rare in my opinion. Most traders would be better off sticking to a simple rule based trading strategy. The authors have a system but are unable to articulate exactly what it is. They do have a system, can articulate it, but choose not to so they can make some more money flogging expensive seminars or newsletters. They don't really have a system at all, but have tried to write down some rules ex-post on what they think they do. In any case it doesn't set a very good example to the amateurs reading their books. If a system can't be written down in a precise algorithm that a computer could execute without any human input or judgement, it isn't a system. Of course there is no point in having a system if you don't stick to it. Even if you are a skilled trader who uses their own judgement rather than some strict rule based method for entering positions you must have strict rules for exiting your positions in the event of a loss occurring. Otherwise you won't know how much capital you have at risk on each trade. The fundamentals are good so I will hang on. Probably a good time to average down actually. The original stop loss made sense but now the Fibonacci retracements have shifted so a new lower level is in order. The short sellers are trying to take out the longs, once they've done that the price will rebound nicely. I can't afford to take the loss! I've already sold out. Why are we even discussing this? If you picked any of the first five options, you are a danger to yourself and your bank account. You thought you had £10,000 at risk on the trade but now its actually much more than that. There are fancy mathematical models like the Kelly criteria and much simpler ways to decide how much to put on each trade. Behind the equations is a simple truth. No matter how good your trading is if you bet too much you will stand a chance of blowing up before your skill is translated into good performance. Consider the genius who develops a trading system with a back tested Sharpe Ratio ratio of 2.0. Ignore the hype of anyone peddling anything better; this would be a really great system. To maximise your expected wealth if you had twenty thousand quid (bucks or euros....) of capital you should aim for an expected annualised standard deviation of returns of around forty thousand pounds a year. Or if you like around 95% of your daily profits should be between minus and plus 5,000. The genius will do pretty well. On average if all goes well they will earn £80,000 a year pretax from their trading system, and more in later years if they can keep money in and compound their returns. If you adjust your risk according to any gains and losses then at that level you have around a 96% chance of keeping at least half your capital over a ten year period. But a 2.0 Sharpe ratio in back test rarely materialises into reality. If you only managed a Sharpe Ratio of 1.0 (which is still very good indeed) then you only have a 50% chance of still having half your capital intact one decade later. And if you've really screwed up and get a SR of 0.5 then there's a very good chance (88%) that you will have wiped out at least 90% of your assets! Most traders would do very well to expect a SR of 0.5. This means downsizing your bets to a quarter of what the 'genius' did. On average you'll make £5,000 a year at that level. Not enough? Then put up more cash. But only what you can afford to lose 90% of if things go wrong. Better still stick to trading part time job. 95% of trading books give lousy advice on position sizing by telling you to set your stop loss according to your capital. So if you are trading crude oil futures and you have £10,000 or around $16,000, then you risk 3% or around $500 on your trade. Fine so far. Since NYMEX crude oil contracts are for 1000 barrels, your stop needs to be 50 cents per barrel below your entry. That means if you buy in at say $100 you will set your stop loss at $99.50. On the other hand if you are a much wealthier person with £1,000,000 in trading capital then with $50,000 at risk your stop loss would be $50 below your entry, or at $50. This doesn't make any sense. The oil market doesn't know or care how much trading capital you have. Since right now it moves roughly $2 a day or less two thirds of the time (one standard deviation of returns) the poor guy is probably going to get stopped out in hours, whilst the rich guy will be waiting months or even years. Some books improve on things slightly by pointing out that the richer guy can trade more contracts. True, but how many more? And should he change his stop loss depending on that? Fact is you should set your stop loss independently of your wealth based only on the dynamics of the market and how long you want to hold positions for. Assuming the poor and the rich guy have the same opinion about these things their stops should be in the same place. Probably somewhere between $0.50 and $50... but lets call it $5 just for the sake of argument. That means that both guys will have the same $5,000 per contract at risk for each trade. You should then buy contracts according to how much money you want to risk on the trade, which of course is dependent on your wealth. That means the rich guy should pony up for 10 contracts. The poor guy shouldn't be in the market at all unless he can trade fractional contracts maybe through CFD's, or if he is going to day trade for which a much smaller stop loss might make sense. Again this is an error made time and time again by many books by 'experts'. Profit targets are pointless. Why should you care about how much money you make on each trade? Isn't it better just to make as much as possible by using a trailing stop loss? Worst still if a profit target like the stop loss is set according to your capital. Profit targets only make sense when they aren't profit targets, but part of your trade logic. So if you believe that a market is oscillating between £1 and £2 a share then of course it makes sense to sell at around £1.90. If you have evidence that trends collapse when they become overextended, and that equates to a level £5 above where you are now, then by all means sell out at this level. This is all good but is completely different from a blanket 'Sell once you have a made a profit of £1000' rule which you apply to any market, regardless of it's dynamics or the reason why you put the trade on to begin with. As well as risking too much capital nearly everyone out there is probably trading too much. I've seen it done by highly sophisticated institutional investors with complex models to optimise trading patterns versus costs. I've also seen it done by naive characters scalping in trading arcades being exploited to create commission flow for brokers. From the maths above someone with £100,000 of capital can probably take a position in one crude oil future. It costs me around 100 cents in commission to trade one crude oil contract. But worst still the bid to ask on that crude oil future is 1 cent, or $10 of real money. So that's $12 per open and close trade if I have to pay the spread. If do ten of those a day I need to make $30,000 a year just to break even. On £100,000 of capital that means a reasonable Sharpe ratio of 0.5 will be pretty much halved. To an extent the financial markets are a zero sum game. You can make reasonable pre-cost returns by not making mistakes. But only if you have a great deal of skill will you make enough to overcome the costs of trading this much (or another advantage like fast connections and a bent market). This one only applies to the really smart people out there who have developed trading strategies through backtesting, data mining, call it what you will. As I said above a 2.0 Sharpe ratio in backtest really materialises into reality. Unless you have a really good grasp of statistical significance then don't even try to fit your trading models. Pick some really simple trading strategies, average them out, run them and stick to them; without going near any backtesting software. I almost guarantee you'll outperform any fancy machine learning / genetic algorithm / econometric magic you care to mention. We can't all be Lewis Hamilton (insert name of favourite professional driver). But we can drive safely and competently without having an accident. Only if you can do that should you even think about trying to go faster. The same is true in trading. Yes it might be that you do have the rare ability to make significantly more than average traders do, but you will never find out if you don't get the basics right. On the other hand if you're just an ordinary person then you can steer clear of blowing up and do okay. 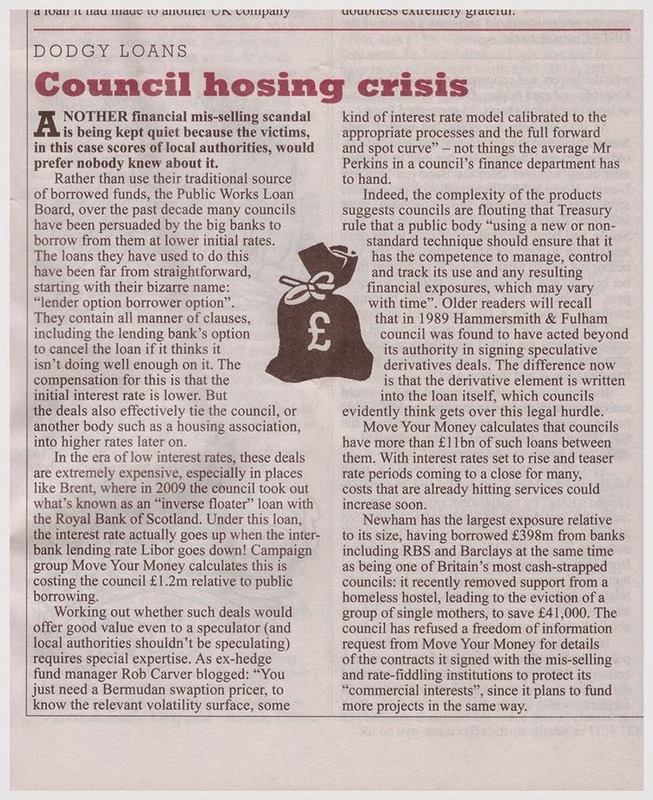 Nice to see this blog quoted in private eye.